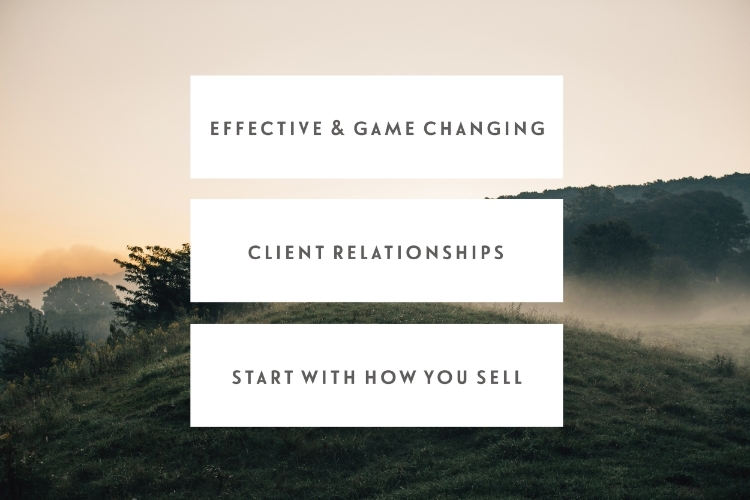 Why do we want to cultivate effective & game changing client relationships? Because that’s how we get results. And word of mouth referrals. And that feeling in our soul when we know we’re doing purposeful and game changing work. Over 50% of the client work I bring in each month is either a direct referral from a current or past client, or a returning client who wants to work together again. That means over 50% of my income is directly dependent on me cultivating effective and game changing client relationships. It’s how I don’t have to be stuck in the hustle of bringing clients in from anywhere that I can find them, and more than anything how I’m able to spend my days working with the dreamiest of dream clients instead of those who I cannot serve best. And what I’ve learned this year is that cultivating effective and game changing client relationships starts with how you sell. Why? How you sell plays a big part in establishing and positioning your brand. It defines your vibe, your vision, and how it is you want to show up and serve others with your work. If your brand is mellow but you sell in a loud way, there’s a disconnect for your community and prospective clients. Think of five of your favourite brands and creatives online and the way they sell and show up with their work. I’m guessing that they way they sell aligns with their brand message, story, and vision. How you sell makes your clients feel a certain way. Whether you decide to cultivate urgency, scarcity, trust, or excitement (or something else altogether), how you sell will have a lasting effect on the people you’re selling to. The question here is this: how do you want people to feel when you sell to them? Like they must hit the buy button now? That it’s okay to take the time to think about it? Like they trust that you will deliver on what you’re marketing? That they trust they will be able to do the work to get the most out of your work together? There’s no wrong answer here, but it’s good to be intentional about how you want the way you sell to make people feel when they engage with your brand. The way you sell can be one of the first jumping off points for the expectations your clients have when starting their work with you. And if you want to cultivate an effective and game changing client relationship, being on the same page when it comes to their expectations is a must. For example, if you sell your services on a result that you can’t actually guarantee to deliver on you’re already setting yourself up for a disappointed client. If you employ sales copy and strategy that, although it may effective, gives prospective clients the wrong impression of your approach and vibe, you’re probably not going to attract the right people for you. I’m a big believer in building an online presence that attracts and repels at exactly the same time. When we try to appeal to anyone and everyone we build an ineffective and diluted brand. The way you sell will help you to attract the right people for you. After working with so many of my coaching clients and helping them to find clarity with their dream clients and create strategy and content to help them to attract them, what I’ve seen is that it’s way more about the mindset of the client than it is the who, what, and where. And one of the best ways to attract the right mindset so you can cultivate effective and game changing client relationships? To sell in a way that connects and resonates specifically with them. So how do you sell in a way that cultivates dreamy, game changing, and effective client relationships? You understand what their pain points are, what they’re looking for, and how they’ll build the trust they need to take the leap into working with you. You understand their mindset, what makes them excited, what they’re passionate about, and how they will be attracted to your brand. Figure this out and you’ll never have to sell in a way that feels icky again, because instead you can market yourself directly to the right people for you who you know you can serve best. Purposeful and effective marketing and sales strategy is something I really believe is built best when you use your own values, vision, intentions, and strengths as your jumping off point. There’s no point selling in a way that doesn’t feel authentic to you. What do you value as a business owner? What is important to you when marketing your work and your services? What’s your vision for the work that you do, and how can you stay true to it by the way that you sell? How do you want your clients to feel when they take the leap into investing in you? How can you cultivate that in the way you sell and market your services? Who are 3-5 people online who sell in a way that resonates with you? What do you connect with when it comes to how they market and sell their services and products? Who are 3-5 people online who, although you respect and love the work they do, sell in a way that doesn’t resonate with you? What don’t you connect with when it comes to how they market and sell their services and products? You have to figure out for yourself what feels good and what doesn’t. Because when you sell in a way that feels icky to you, you’re not going to be able to show up in a way that truly resonates with the right people for you. Here’s how I see it: you can get lost in the hustle of just booking any old client you can find, or you can take the time to build content, marketing, website, and sales strategies that move you and your brand forward in an effective and purposeful way. You may be able to attract clients by cold tweeting and emailing, or by trying every marketing strategy in the book without actually figuring out what’s best suited to your brand, but you’re probably going to find yourself with clients with unrealistic expectations and probably super far away from the dream clients you had in mind when you started your business. Or you can build an online presence and brand that helps you to attract dream clients, establish your expertise, and position your messaging and methodology so that you can attract clients who are crazy excited to work with you. What I’ve found more than anything is that when you work with someone who has already built a relationship with you, your brand, and your mission and your message, you can have a much more effective and game changing client relationship along the way. If you’re fed up of attracting clients who don’t feel like the right fit, who you can’t get the best results for, and who don’t turn into lifelong brand ambassadors, referral machines, and returning clients and customers along the way, I encourage you to go back to basics and reconsider how you’re marketing your services online. Because that’s where it all starts. As always, I'm rooting for you. Any questions? Let me know in the comments below.